We have been enjoying the amazing weather the last couple weeks and I wish I had more pictures of our adventures. Boden got his first tooth, which I now blame for his crankiness when we got our family photo's taken. You can see some of Alicia Browns fantastic work (including a preview of our family) at her blog. She is great to work with and I highly recommend her! We also got lost at Lone Pine State Park. Apparently there is a trailhead at the bottom of the hill, but instead we drove to the top and got lost on what now we realize was probably just an animal trail. We did however see great views of the changing tamaracks across the valley. 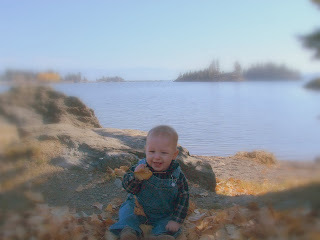 We have spent time at woodland park and today I stopped in Somers to take these pics of Boden in the fall leaves. He tries to eat everything, but I got a few before he chowed down on too much foliage. Enjoy. You're quite the photographer yourself :)! Love the leaf pics! I did see Alicia's pictures of you guys! They were incredible! I know she's good and all, but you guys are a wonderful sweet family and it shows!!! LOVED your family photos on Alicia's site!!! You all are so beautiful!! !